I love salmon but it wasn’t something I grew up with as a kid in Ontario. But living here in beautiful coastal Vancouver certainly makes it easy to have good, sustainable salmon on the dinner table. I was lucky to find some wild salmon on sale, so I bought a couple sides, cut them into small fillets and froze them for future use. I made this recipe for a weeknight dinner so I wanted to simplify things as much as possible. It was getting late and we were hungry, so I made some super quick sticky rice (clearly, I’m a big fan) and set up a savoury dressing for the kale and salmon. Two birds, one stone – so to speak. Easy! There’s heat with the sriracha, saltiness in the soy sauce and some natural sweetness from the coconut (make sure to buy the unsweetened kind!). 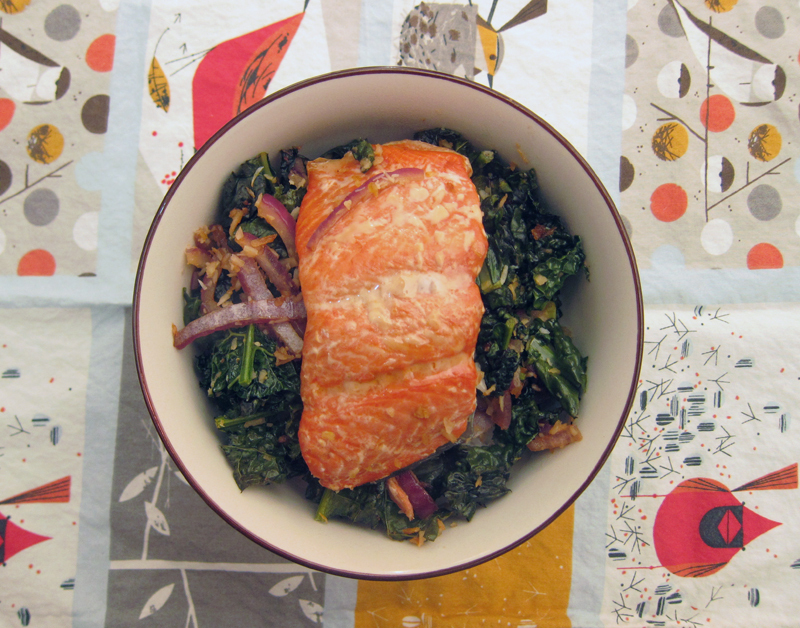 The kale gets lightly crispy and the salmon cooks on top making this a perfect weeknight meal. See that white stuff leaking from the salmon? That’s albumin which can mean that you’ve overcooked the salmon. This salmon wasn’t overcooked at all, but I probably should have removed it from the oven a bit earlier or just used a thermometer to test for doneness. The USDA recommends 145F but I think 130F should be about right – you can take it out of the oven and let it sit for 5 minutes under foil. Give the rice a through rinse: I use a colander & my hands to swish the rice vigorously for 1 minute under running cold water. Drain & place in a small pot along with 1 1/4 cup water. Bring to a boil and then reduce heat to minimum for 8 minutes. Keep covered, no peeking & remove from heat. Make a dressing with the garlic, coconut oil, soy sauce, sriracha and sesame oil. 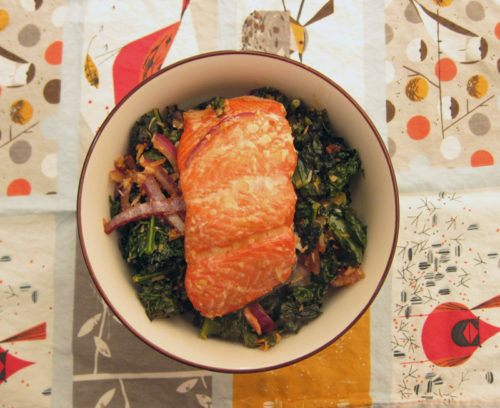 Brush some of the dressing onto the salmon filets and then add the kale and red onion into the rest of the dressing and toss well. Place the kale evenly onto a baking dish and bake for 5 minutes. Top with the salmon filets and bake for another 15 minutes or until the salmon is cooked and the kale is crispy around the edges – take care to make sure the kale doesn’t burn. Serve in large bowls filled with sticky rice and topped with the kale and salmon. Serves 2 but can easily be doubled. This looks so good! I’ve never roasted anything on a bed of kale before, what a great idea. 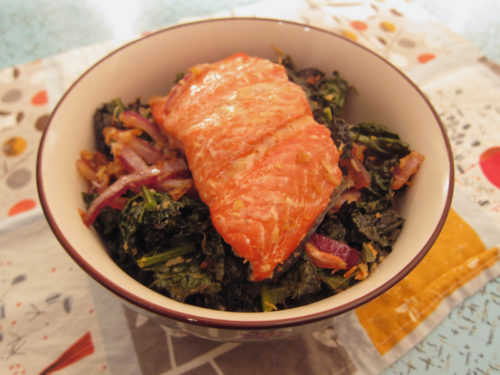 I’m always looking for new salmon recipes and I loveeee the idea of coconut kale! Yum! I love everything in that bowl. I wish I could eat salmon more often. The good quality stuff is so expensive and I try to avoid Atlantic salmon, so I end up eating plenty of tinned Millionaire’s sardines for Omega 3 sources. I had no clue that the white stuff on salmon means it’s overcooked. Good to know about removing it sooner. Mmm, sticky rice….now that’s something I haven’t had in a while. Adrienne, it’s tasty and healthy! Joanne, yeah, we got quite a deal and our freezer is happily stocked. Lucky to live on the coast! !